For some of us this was our first sail of any length on RelaX and all six of us were greatly looking forward to the week on it. And the yacht didn’t disappoint us! The planned cruise was from Milford Haven to the River Conway estuary. It turned out very eventful right from the start! Saturday night in Milford Haven – we went to the nearby pub for a meal and found ourselves in the middle of a wedding celebration that had taken the pub over! Our second event was to find that the tidal flows and times of slacks showing on the plotter at headlands and sounds did not always follow the tidal atlases and pilots. As our plans involved a few of these it was a big impact. We had to go round a couple of islands instead of through the passages by the mainland, but the speed of the boat in good winds helped us out. (Since that week, it has become apparent that the plotter might have been out-of-calibration, but whilst that may have been a factor, in critical local geographies with ebbs and flows running across the prevailing flows, the timing of slacks can indeed be affected by conditions). 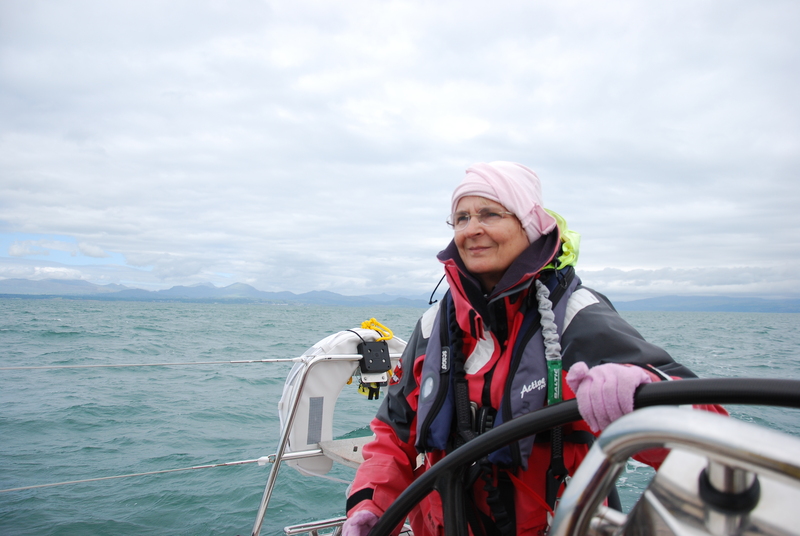 Our plan was to sail the Welsh coast in order to admire the rugged and mountainous landscape of the country. The first two days were long passages to get us up to North Wales. However the passage depended on the extensive and busy Aberporth Missile and Artillery range – the third event! It was only on the Friday afternoon the firing days were announced for our week. Fortunately there was no firing for our hoped-for day through the range, but for the next two days the prohibited zones stretched right across Cardigan Bay. 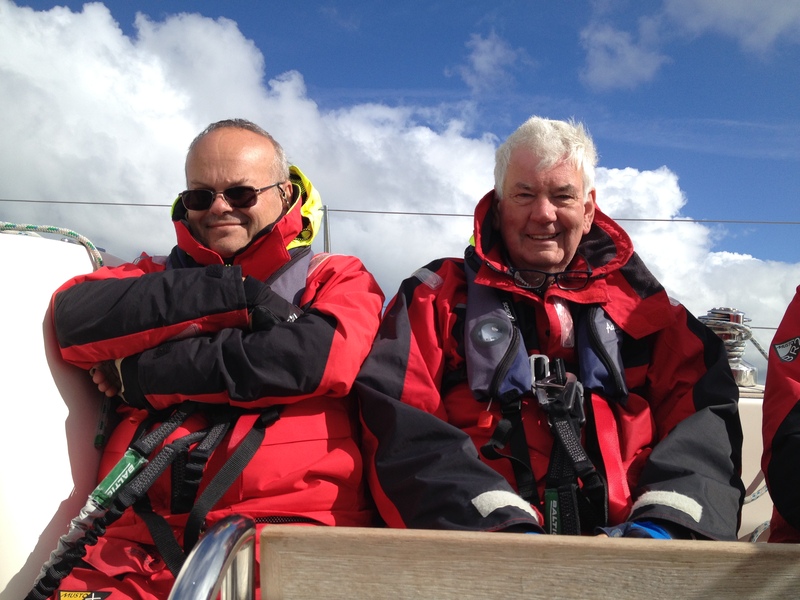 We’d have had to make a very early start to reach Pwllheli Marina in time! As it was we got to the tidally challenged Pwllheli Marina entrance just in time with the tide falling. 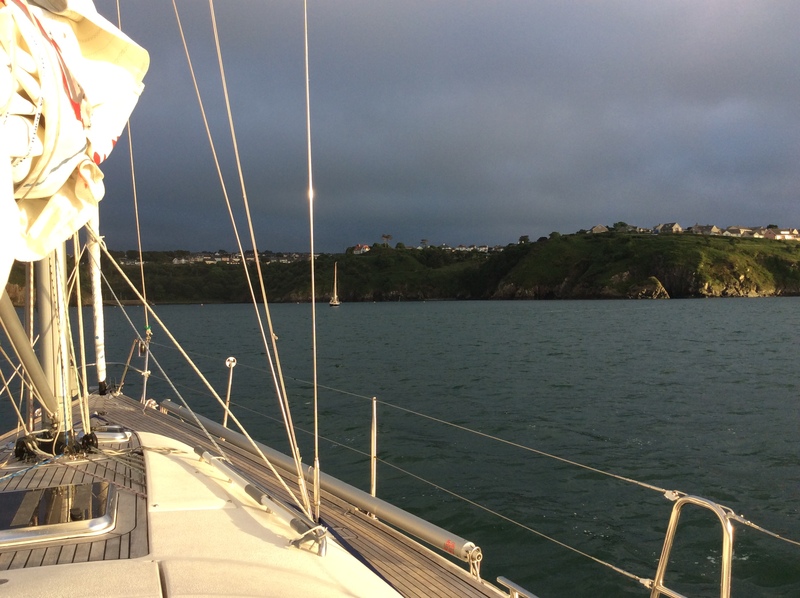 We nosed up the channel at 2 knots against the ebb, with one or two moments when the channel did not seem to be quite where it should have been! Once tied upwe looked at the publication date of the new-bought pilot – 2015! Things change in bending, silting channels! Because of the forecast S 5/6 we spent a second night in Pwllheli rather than move forward to the planned swinging mooring off Abersoch, exposed to such a direction. Abersoch is the Rock, Cornwall of the North. Whilst Judith pursued her private passion of castles by taking a bus to Caernarfon, the rest of us took a car taxi to Abersoch for the day rather than the planned water taxi from that Abersoch mooring! A very picturesque village and drying harbour. 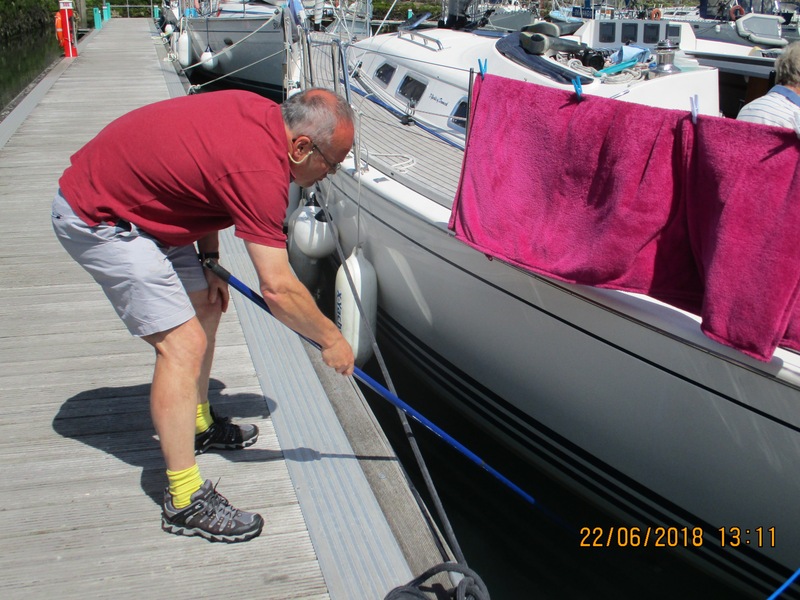 The wind dropped a little and veered SW after the second night in Pwllheli, and waiting for the tide to rise to allow us out, we replaced the Windex. “We” actually means Allan, who stepped forward offering to go aloft, being very adept with fittings and best physically suited. Fitting on a new Windex means manipulating the old and new fittings on the cap of the mast, so one cannot steady oneself by holding any mast above one’s head. We had a big glass of high grade Bermudan rum for him afterwards! A sail round north Cardigan Bay took in Criccieth and Harlech castles, sights up the broad estuaries and grand views of Snowdonia. The last day sailing was big Highs and a big Low. A glorious sail past the lighthouse of St Tudwall’s Islands, around the Lleyn taking in the Bardsey Sound. Lovely sea and breeze, and great scenery of coves, beaches, cliffs, fields, hills and mountains. We curved in to look at picturesque Porth Dinllaen. 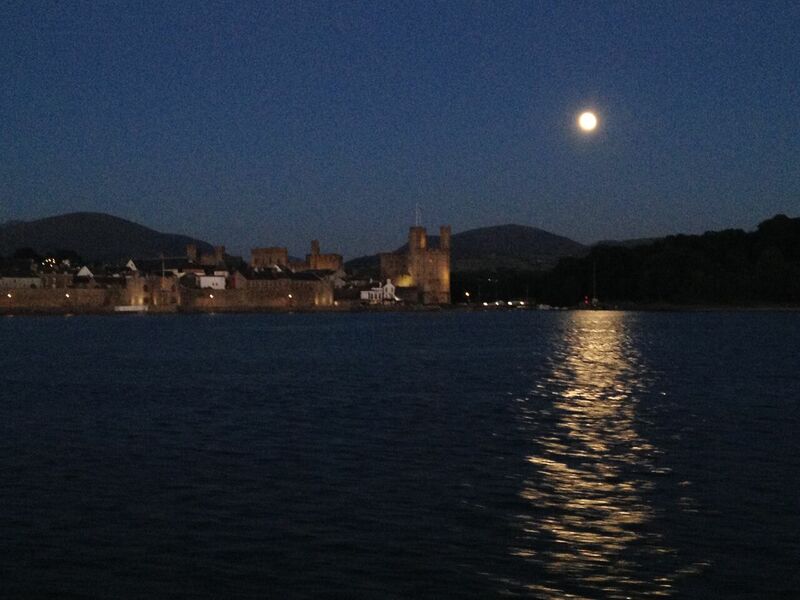 No more than “curving in” because the tidal gate through the sound had prevented an earlier start, and the tidal gate at the Caernarfon bar required an arrival time there to get the most of the water through the channel and Strait up to Port Dinorwic. It was when we started preparing to motor to the channel through the bar with sails down that we realised we had no propulsion. Unfurling the genoa again showed the shackle at the head was now lost as well. 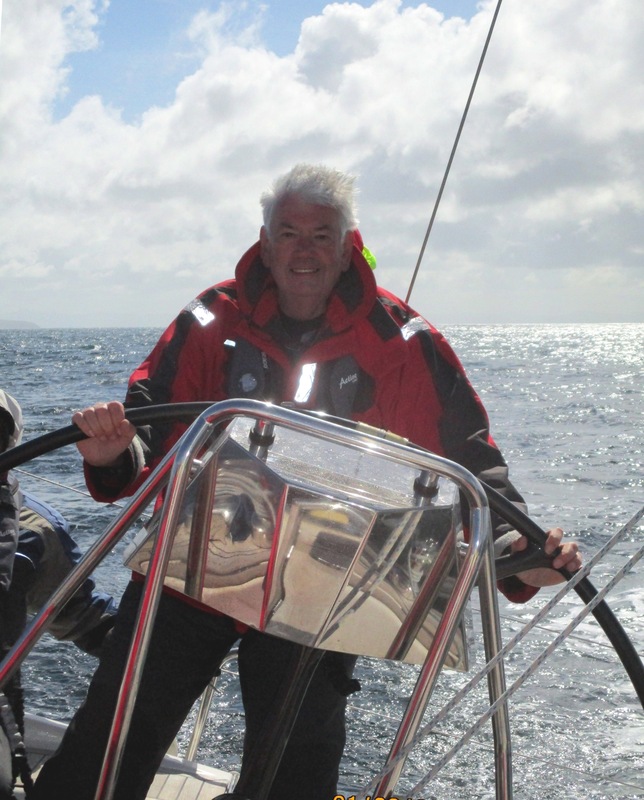 Whilst we still had steerage way under the mainsail and were in open water, where we could go from there was a challenge. It was a welcome sight later to see the big lifeboat from the new station we’d seen in Porth Dinllaen approaching at high speed. 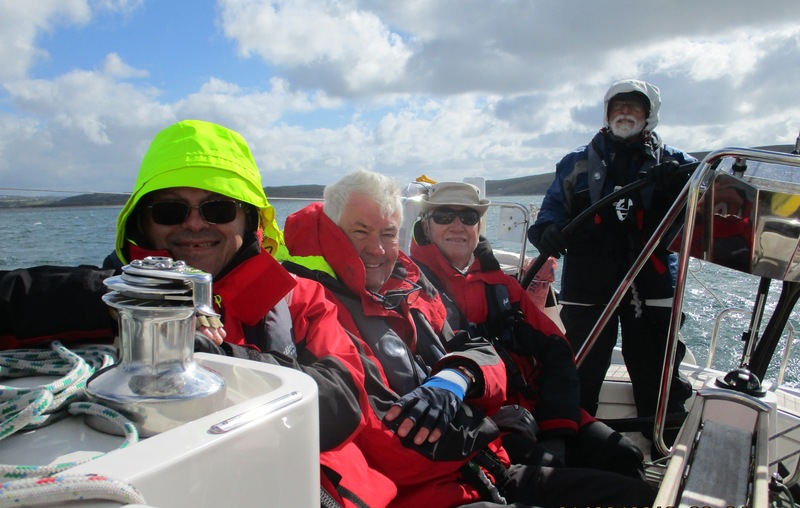 Its crew did a great job – they took us in tow to a safe water mooring just off Caernarfon marina where we could spend the night, despite the fact that they were tide limited across the bar like anyone and they had to get out again. The next morning the helpful Marina Master towed us to a berth in Victoria Dock so we could get to work in still water. We cannot speak highly enough of the readiness of the Porth Dinllaen station and the skills of the crew. 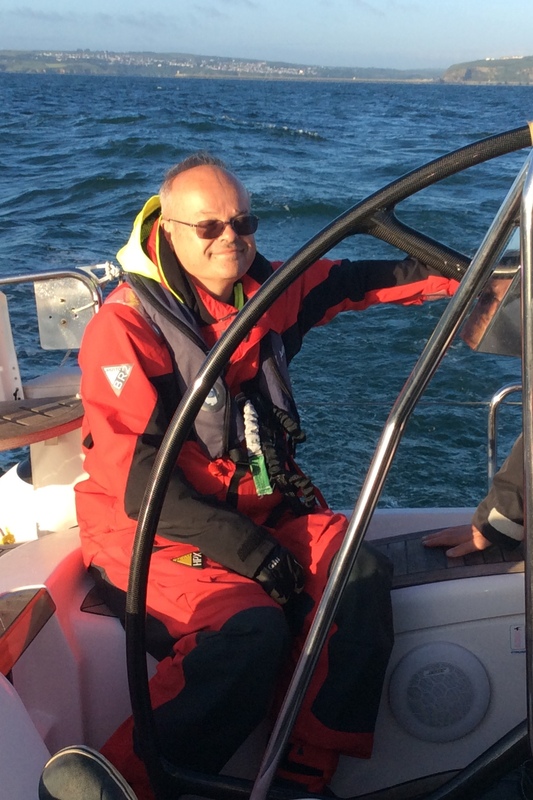 The Club, not least myself and the rest of the crew, were very fortunate that Richard Ash, bosun, was on board, and that he would be staying for the next week. He did a great job at sea of immediately checking inboard for any failure, mobilising an engineer, tracking down a replacement propeller and getting a delivery date, and organising the earliest lift-out in an tidally constrained area chronically short of yards. 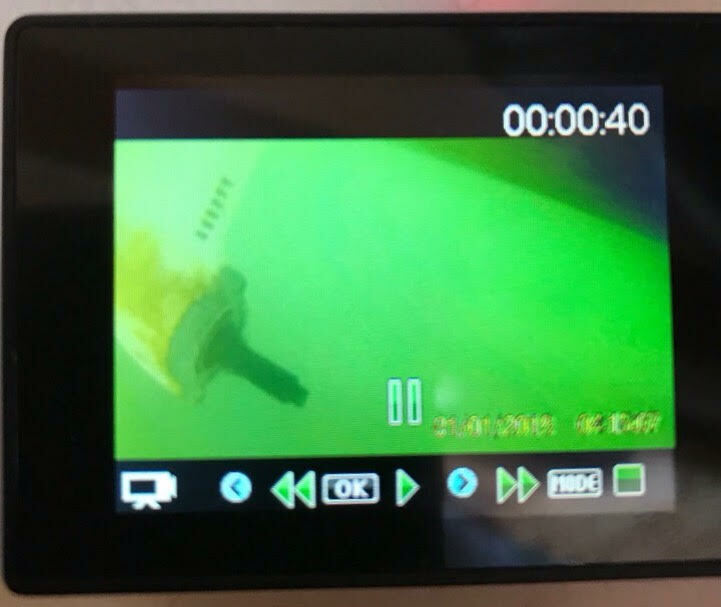 As well as his knowledge of the boat and expertise in its equipment, Richard was resourceful in, for example, getting an underwater camera to look at the saildrive/propeller assembly. That made it certain what the problem was and saved days of time. The incident reminded us that having one important failure doesn’t make it any more unlikely that a second failure might happen quite independently of the first. I was grateful for having good margins of safety of sailing room. Equipment failure and loss of a day’s sailing apart, we had great sailing over distance, and with wonderful sights. RelaX accommodated us very well, sailing, dining and sleeping. Ted Sankey, with Richard Ash, Judith Hankey, Phillip Harries, Allan Wright and new member Patrick Tyrrell. 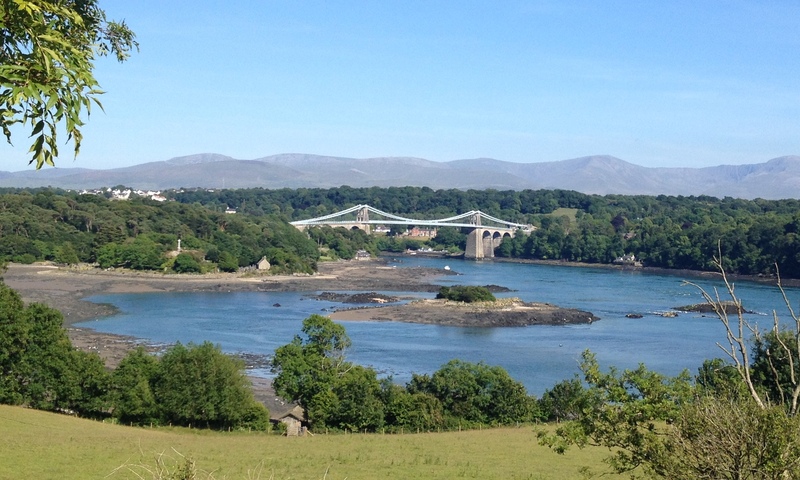 Menai Strait – By Land If Not Water! 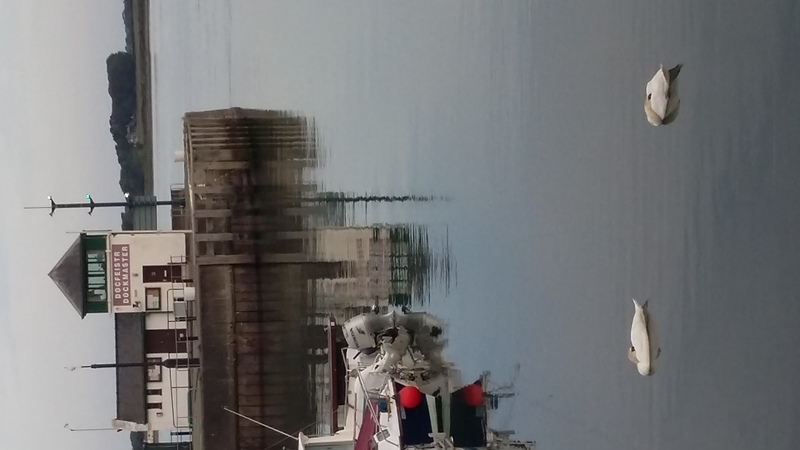 Regarding the comment about tidal streams off SW Wales, I came across a very good Android app for both tides & tidal streams – Absolute Tides https://apkpure.com/absolute-tides/uk.co.absolute.tides – a one year subscription cost £2.99. Before setting off on the return trip (week 10 – Deganwy to Milford Haven), I printed out (screen grabs) of the pages for NP256 Tidal Atlas – Irish Sea & Bristol Channel – and found detailed differences compared with the ancient 1994(!) edition on board, including in the vicinity of Skomer/Skokholm islands. So although we might assume the tides haven’t changed, UKHO has obviously corrected the data! In any case, there are significant tidal races on the west side of the islands – which we also decided to avoid by going outside.